Facebook shocked the social media marketing world recently be removing the restrictions on Fan Page contests. 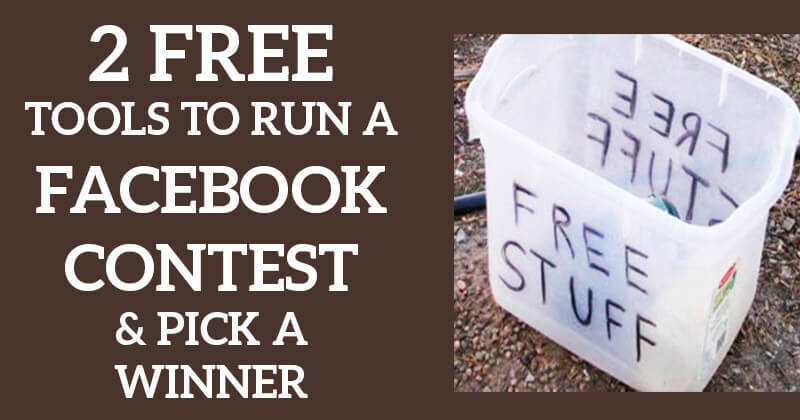 You can now run a Facebook contest right on your page & do NOT have to use a 3rd party app. We surveyed some app companies & Facebook marketing experts & there were mixed reviews on whether this was a good or bad thing. Personally, I think it's a great change -- for small businesses especially. 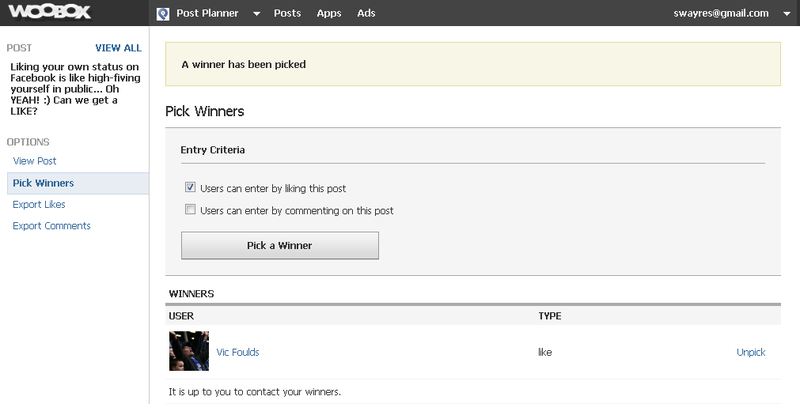 It's now much easier to start & run a contest on your page -- no need to buy an app or learn how to install one. Collecting entries could be overwhelming -- what if your contest gets 1000 likes & comments?? How do you select a winner in an unbiased way? How do you notify the winner easily? 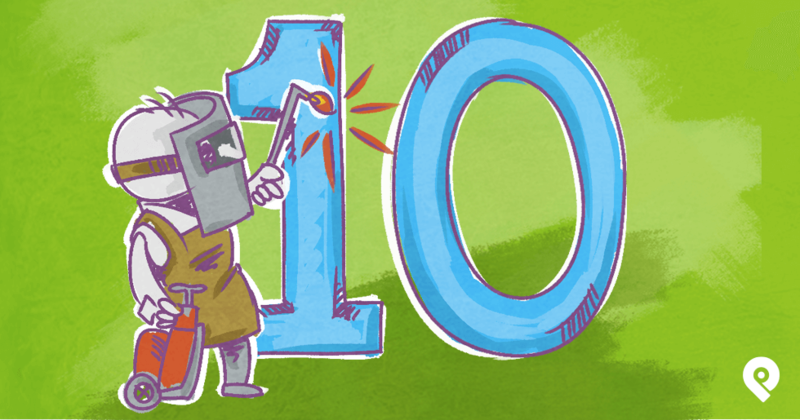 If your contest only gets 10 entries, then you could very easily just run it on the page & not have any difficulties. But when your page is larger, this seems difficult to near impossible. Let's say this image below from Pepsi was a contest & to enter you only had to Like the photo. 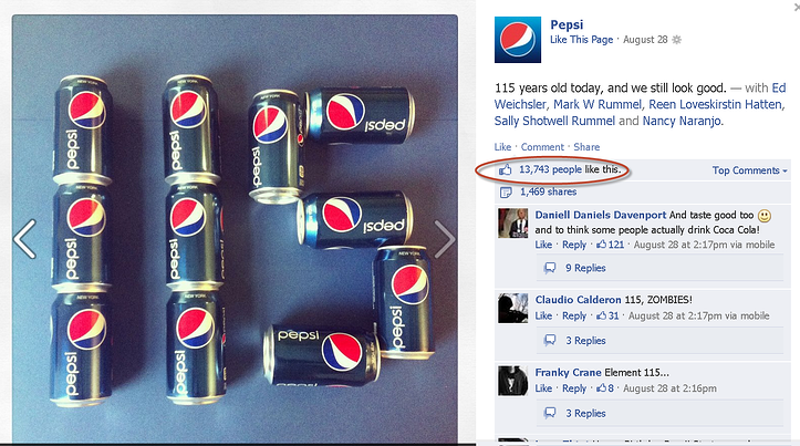 With nearly 14,000 Likes, there's no way in the world Pepsi could pick a winner -- other than simply scrolling through who Liked the post & just deciding on someone. Doesn't sound like a fun way or a smart way to run a contest. 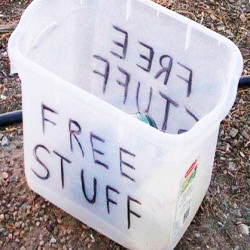 Running an Efficient Facebook Contest on Your Page -- For FREE! 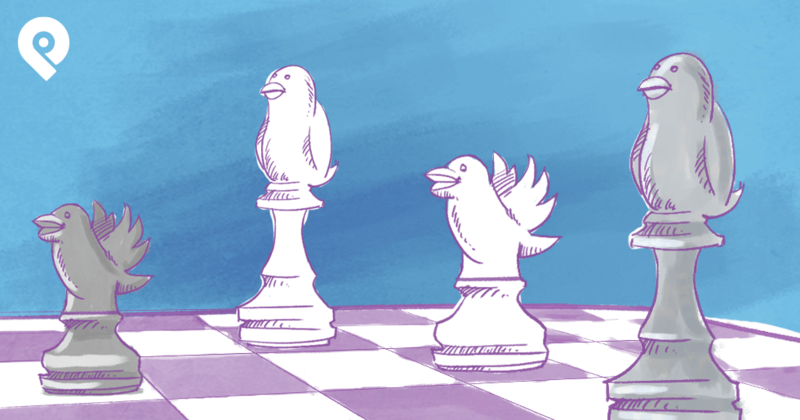 Immediately following Facebook's announcement of the rule change to contests, app companies everywhere began shuffling to find a solution for page owners to run contests effectively. 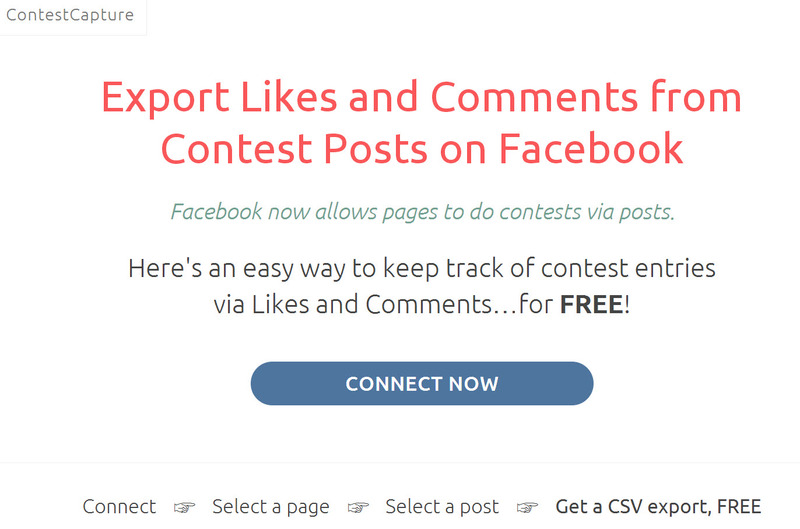 Edgerank Checker was the first out of the gates to offer up a tool that exports Likes & Comments from contest posts on Facebook. Oddly enough, they aren't even a contest app provider! Which means they don't have a dog in this fight -- they simply wanted to offer up as quick solution so they created the site & product called "Contest Capture". A few different permissions will load up -- simply allow all of them. If you don't allow all permissions, the app can't pull data from your pages. Don't worry -- they're not going to post anything to your timeline or your page's timeline. After selecting a page the app will take a few seconds as it pulls the posts from your page. Now choose the post related to the contest. We haven't run a contest on our page at Post Planner yet, so I'm going to select the post from 9/3 " Liking your own status on Facebook..." as I know that post had decent engagement. You will need the ability to open a .csv file (Excel file) to proceed from here. While having all of this data in a spreadsheet is much easier to digest & pick a winner -- rather than simply looking at the post on your page, it still falls short. 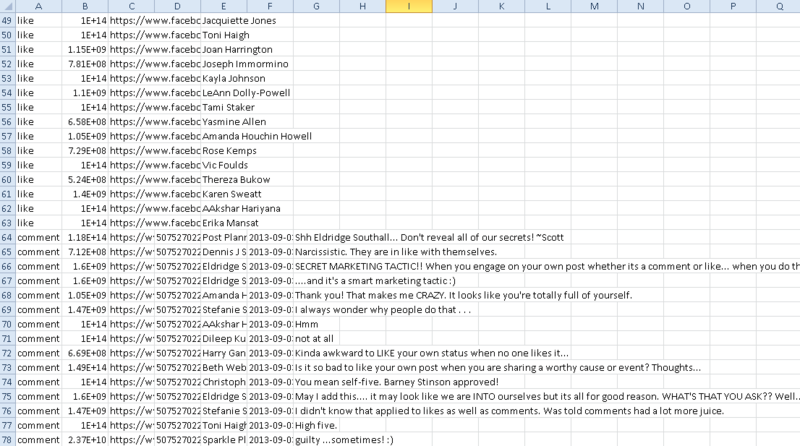 You could select all of the Likes & simply do a random sorting & have #1 be your winner. Or you could print out all of the names that liked or commented, cut them out & then select the winner from a hat live on a video or something. But some work will need to be done on your part to select the winner -- while ensuring trust in your fans that you aren't simply selecting your best friend as the winner! 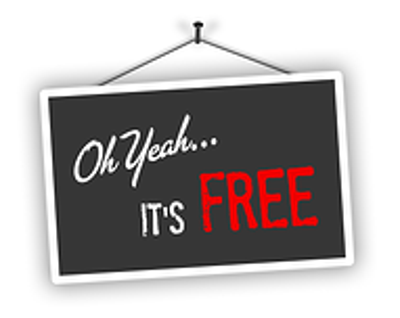 >>> Is there an even easier -- and free -- solution to run a contest on your page & choose a winner? Yep. Let's talk about Woobox. Woobox has long been the app provider of choice for many page owners -- although I'll admit I've never been a big user of it. Their app works similar to the Contest Capture app by Edgerank Checker, but goes a step further in helping you select a winner. You'll need to use the "Sign In Using Facebook" option. If you don't have a free account with them already, this will set one up. You could use the email sign up option, but it's much easier to sign in with Facebook. Be sure to click "Okay" on all of the permission boxes that pop up. If you don't, Woobox won't be able to pull the information from your pages it needs to administer your contest. Now that you've selected the correct page you'll want to see all of the posts from that page. Simply click "Posts" & you'll be shown posts from the past 10 days. Just as we did with Contest Capture, we need to choose the appropriate post related to our contest. For our purposes here I'll choose the "Liking your own status..." update again. Then all you have to do is click on "Pick" next to the post related to the contest when you want to choose a winner. Or from users that liked or commented on the post. With all options a winner will be selected at random. 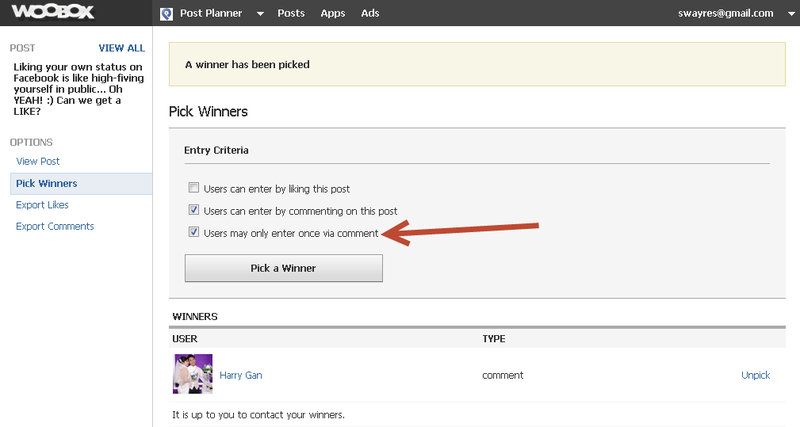 If we choose "Users can enter by commenting on this post" we are also given a 2nd option that only allows users to enter the contest once -- this is pure genius on the part of Woobox! Lastly you can tick the box for "Users can enter by liking this post" & "Users can enter by commenting on this post" & both entries will count. This could mean people would get multiple entries -- 1 for a like & 1 for a comment -- but this does allow you to let people enter by simply "Liking or Commenting on Our Post". You can see in my example below I chose both options & when I clicked "Pick a Winner" a few times I got winners from both Types. Obviously most contests don't have multiple winners, I simply continued to pick a winner to show you that winners are randomly selected from both types. Regardless of how you choose the winner -- likes or comments -- it is up to you to contact the winners. The great thing with the Woobox tool is you can click on the person's profile & either send them a message from your personal account, or perhaps tag them in the contest post itself. 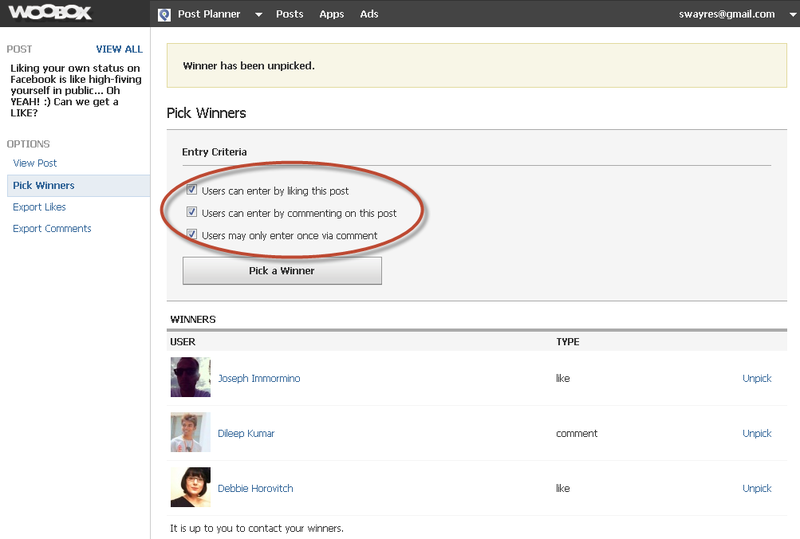 That's the 1 major downfall of running a page timeline contest -- you don't have an email address to notify the winner. 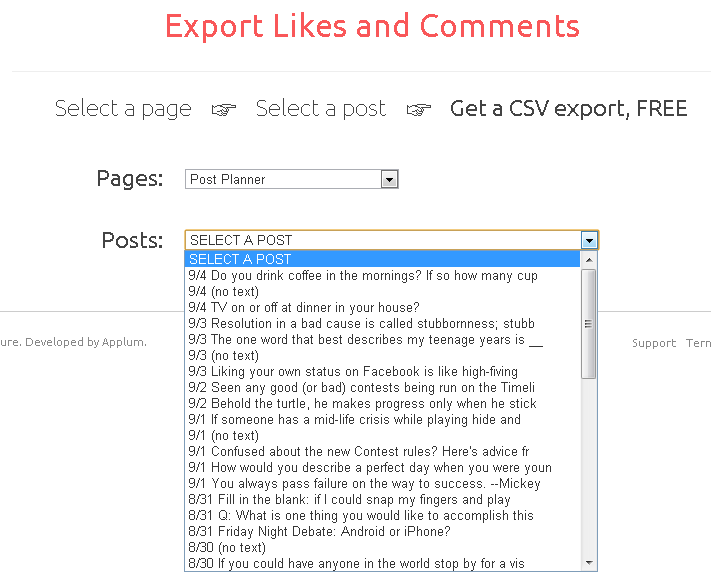 ** You can also export the list of Likes & Comments to a CSV file that you can store for later. I'm not real sure where the value would be in having this csv file after picking a winner. Woobox also allows you to "Unpick" a winner - this comes in handy if you were just playing around & wanted to see how it works -- but also if you have rules on your page that a person can only win once every 30 days or similar. If a recent winner comes up & is ineligible, you could simply unpick & pick another winner. Contest Capture & Woobox's new features are both great -- however I gotta say that Woobox wins hands down, if this were a competition! The ability to allow them to choose the winner takes that off your shoulders & will give your fans proof that you did not select the winner of your choice. If I were running a contest using this method I would simply do a screencast type video & record myself going through this process & picking a winner -- so there would be no questions about me being unfair. There are a few other tools out there already that will also help you in this process -- but most seem to be only available to paid members of those apps. 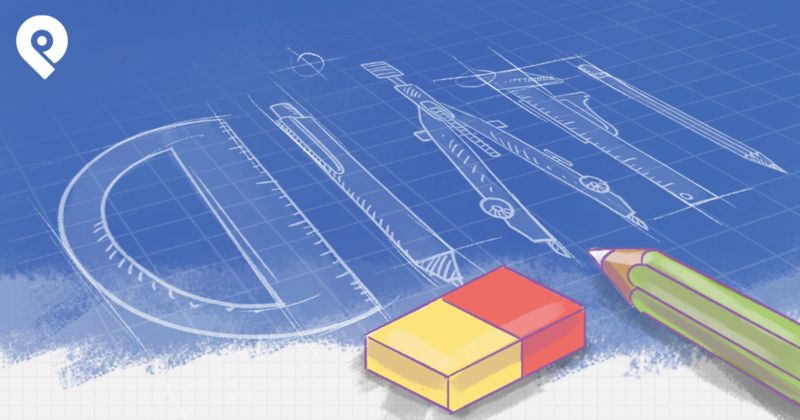 >> Heyo has announced they have a contest related tool in development called "Timeline Contest Creator" -- but as of writing this, it's still not available to the public. I don't know if this will be a paid or premium feature, we'll wait & see. >> Tabsite announced they too will have a "Timeline Contest App" -- but it's still in development as well & no word on cost. I'm sure more app companies will add this to their arsenal. Make the prize relevant to your company! 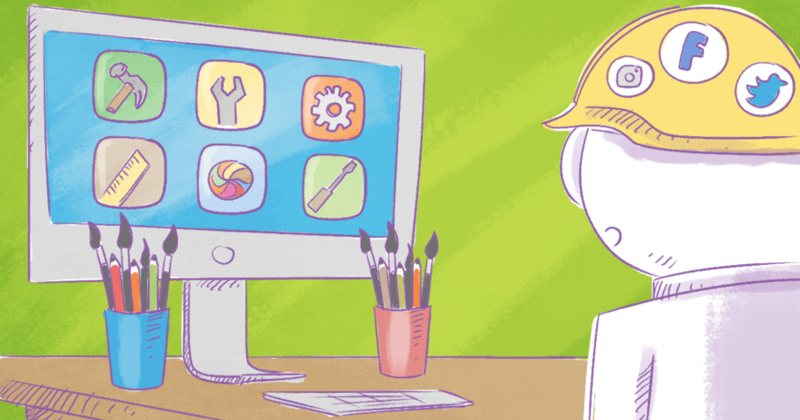 – an iPad is not relevant if you own a craft store. Ensure the prize value equates to your product – $30 Gift Card for $600 watches is not a motivating deal! Keep the contest moving! – don’t run a month-long contest. The attention span of a Facebook fans is short.